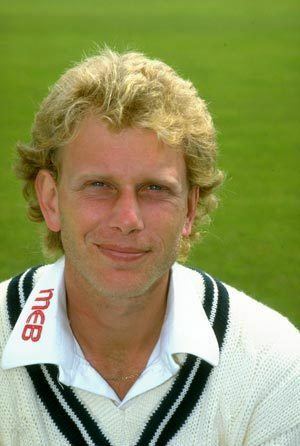 Graham Roy Dilley (18 May 1959 – 5 October 2011) was an English cricketer, whose main role was as a fast bowler. He played first-class cricket for Kent and Worcestershire, and appeared in 41 test matches and 36 ODIs for England. He is perhaps best remembered for his tail-end batting with Ian Botham in England's second innings at Headingley in 1981, reaching his Test highest score of 56 in an eighth-wicket partnership of 117 in 80 minutes. This helped England to beat Australia despite following on and being quoted as 500–1 outsiders. Cricket correspondent Colin Bateman, commenting on his effectiveness, noted, "... when it all worked, it worked beautifully". Dilley was born and raised in Dartford, Kent, England, attended Dartford High School. and played his early cricket for Dartford Cricket Club at Hesketh Park. 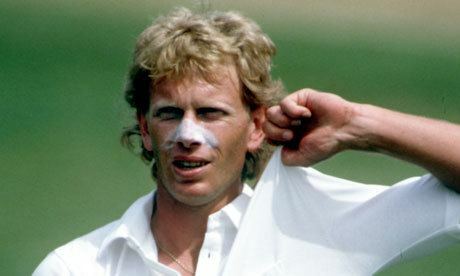 He trained as a diamond cutter in Hatton Garden before embarking on a cricketing career with Kent County Cricket Club. He played for the Kent Second XI in 1976, aged 17. He was married and divorced twice. Kent cricketer Graham Johnson was a brother-in-law. He had four children, including Chris Pennell, vice captain of Worcester Warriors rugby team. His youngest son, Jonathan, has also represented Gloucestershire Second XI as a Left Arm Orthodox Spin Bowler. Dilley made his first class debut for Kent at the age of eighteen in 1977, against Cambridge University. He failed to take a wicket, and was not selected again until the following season. He played his second match in June 1978 against the touring Pakistani cricket team, but again failed to take a wicket. It was only in his third first-class match, against Middlesex, that he made his presence felt, taking seven wickets in the match to help his team to a six-wicket win. Dilley played two more first-class matches that season but took only one wicket. Perhaps more significant was his selection for England Young Cricketers against their West Indian counterparts for two of the three "Tests" and the single one-day game. Real progress in county cricket, however, would have to wait for 1979, when Dilley played 31 senior games for Kent, including a useful effort of 4–41 in the World Cup warm-up match against the New Zealanders. He finished with 49 first-class wickets at an average of 23.48 that season, and already his express pace was attracting attention. The England selectors, looking for a young fast bowler for that winter's tour of Australia, took the bold decision of including the 20-year-old Dilley in the squad, and he made his international debut in an ODI against West Indies, played as part of the triangular tournament featuring those two teams and Australia. Dilley played his first One Day International match on 24 November 1979 against West Indies at Sydney during the 1979/80 Benson & Hedges World Series Cup. The match was won by England by two runs. Dilley was given the new ball and struck in his third over when he claimed the wicket of Desmond Haynes. Rain forced the match to have a revised target and the West Indies needed to score 198 runs in 47 overs to win the match. They fell short and lost the match. Dilley finished with 6–2–21–1 with an economy rate of 3.50 runs per over. A fortnight later, Dilley appeared in his first Test match, making him the youngest cricketer to play for England in thirty years when he entered the field during the Perth Test at the WACA on 14 December 1979. English captain Mike Brearley showed confidence in Dilley and gave him the new ball at the start of the Australian first innings. Dilley did well during his initial bowling spell, but had to wait until Australia lost their fifth wicket on 127 runs to claim his first Test Wicket. The batsman was Peter Toohey, caught by Derek Underwood for 19. Dilley then claimed his second wicket when Rod Marsh was caught behind by Bob Taylor. Marsh had scored 42 runs and Australia were 219 for 7 at that point. Australia finished 244 all out, and Dilley took figures of 18–1–47–2 with an economy rate of 2.61. 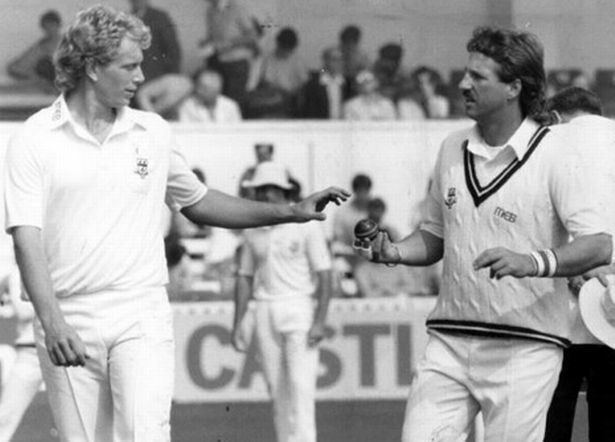 However, his debut bowling performance was over-shadowed by Botham taking 6 for 78. England were all out for 228, giving a lead of 16 runs to Australia. Dilley scored an unbeaten 38, and stayed at the wicket for 206 minutes, facing 57 balls. His score was the second highest in the innings, after captain Mike Brearley. Dilley again took the new ball in Australia's second innings, but did not get a wicket until Dennis Lillee gave a catch to Peter Willey at gully. Lillee scored 19 runs and England needed 354 runs for victory. Geoff Boycott showed resistance with an unbeaten 99, and Dilley made a partnership of nineteen runs with Boycott for eighth wicket. England finished 215 all out, and Australia won the Test by 138 runs. England lost the match by 138 runs, and although Dilley also played in the second Test, which was also lost, he was replaced by John Lever for the third and final game. Dilley took only seven wickets on that tour – "£7,000 for seven wickets" as the tour manager Alec Bedser commented. The Australians triumphed in this match as well, to win the rubber 3–0, although the Ashes were not at stake, and were retained by England on the basis of their 5–1 victory in the six-game series that had been played a year earlier. In 1980, Dilley was not selected until the third Test against West Indies, at Old Trafford. Rain intervened, as it was to do in the fourth and fifth Tests as well, and all were drawn. Dilley's eleven wickets, in the three innings he was able to make use of, made sure of his place to face the same opponents in the Caribbean that winter. England were outplayed in the overseas Tests and lost the four-match series 2–0 (the Guyana Test having been cancelled over the Robin Jackman affair) and both ODIs, but Dilley's ten wickets were enough for him to retain his place for the 1981 Ashes series. Dilley began the 1981 Ashes series strongly, taking 12 wickets in the first two Tests, and was thus retained for the third Test at Headingley. This game is best remembered for England's sensational victory after following on, and for the heroics of Ian Botham and Bob Willis, but Dilley played his part as well, albeit in the unfamiliar role of batsman. 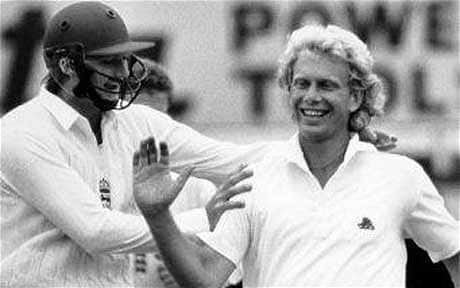 Coming to the crease in the second innings with England at 135–7, 92 runs in arrears, Dilley had no orders from his captain, Mike Brearley, when he joined Ian Botham at the crease. Botham said, "Right then, let's have a bit of fun", and the two men put on 117 in just 80 minutes before Dilley (56, from 75 balls) was bowled by Terry Alderman. England eventually established a lead of 130, and Dilley then held a boundary catch to dismiss Rod Marsh in Australia's second innings. Exceptional bowling by Bob Willis (8–43) bowled Australia out for 111, and gave England an unexpected victory by 18 runs. Despite his part in the win at Headingley, Dilley did not play in the fourth Test, nor in the two that followed, being replaced variously by John Emburey, Paul Allott and Mike Hendrick. He did get picked for the subsequent 1981/2 India tour having pulled out of Graham Gooch's rebel tour of South Africa, something he regretted for financial reasons. Despite being in and out of the side for the next couple of years, Dilley's future as a Test player seemed reasonably bright by 1983 as he played a full part in England's World Cup campaign. Following the tournament, a neck injury forced him out of the game for a year, and although he returned to county cricket in 1985, there was some doubt as to his long-term prospects. 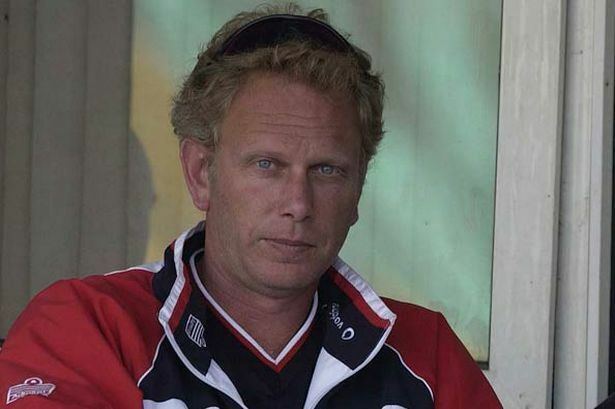 A decent performance that winter for Natal helped in his rehabilitation and, by 1986, Dilley took 63 first-class wickets and earned a recall to the England side. Between 1986 and 1988, Dilley took 83 Test wickets at an average of 26.43, and was generally regarded as England's foremost strike bowler. He developed significant pace and outswing from a long, wide run up, approaching the wicket at an angle almost 45 degrees. Perhaps his most significant success came in 1986/87 when he took 5–68 in the first innings of the first Test at Brisbane to help his team to a victory that set them on their way to an Ashes win, and he also took 20 wickets at 15.85 in ODIs. In the drawn series against New Zealand the following winter he produced his career-best bowling figures, ripping through the Kiwi line-up with 6–38 (including the first five wickets to fall) at Lancaster Park, Christchurch. He was fined £250 in the same match for swearing at the umpire, comments which were clearly picked up by the stump microphone. He took a further 5–60 in Auckland, and finished the series with fifteen wickets at an average of 14. His bowling style often fascinated many, with his unusual run-up a topic of discussion. 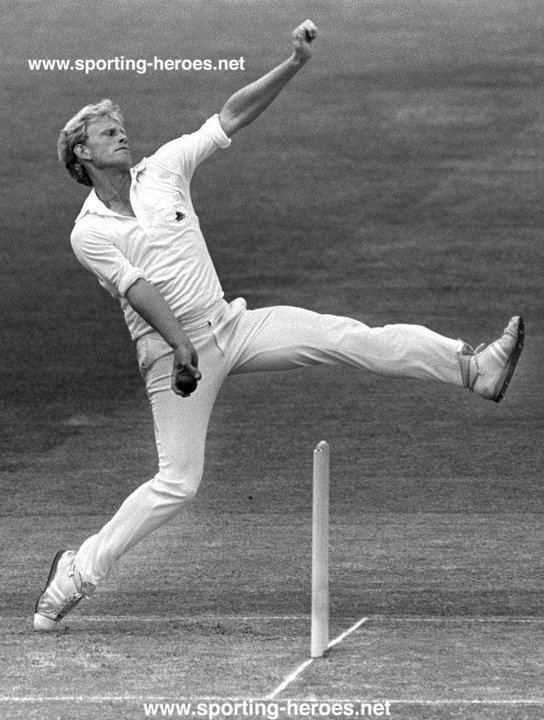 It is believed that he tried to adopt the Jeff Thomson's slingy bowling style, and later Dilley's style was used by Chris Cairns in New Zealand. 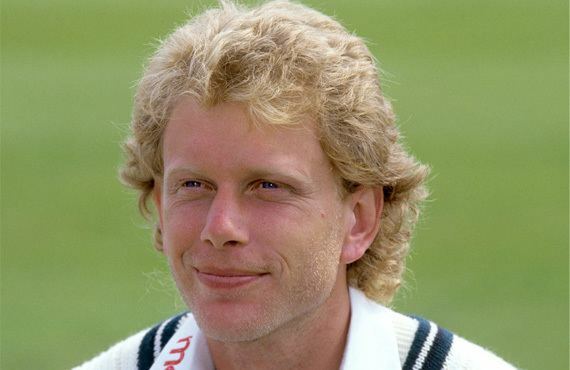 In 1988, when talking about the effects of coaching fast bowlers, Geoffrey Boycott commented, "Remember what happened to Graham Dilley, who started out as a genuinely quick bowler. They started stuffing line and length in his ear and now he has Dennis Lillee's action with Denis Thatcher's pace". For the 1987 season, Dilley moved to Worcestershire, and his new county were about to begin the most successful period in their history, winning four trophies in the next three years. Despite further injury problems, he proved a vital cog in the wheel as Worcestershire won the 1988 and 1989 County Championships; it was during this period that he wrote, with team-mate Graeme Hick, an account of one of the title-winning seasons, somewhat painfully entitled Hick'n'Dilley Circus. Dilley's Test career was beginning to wind down by this time, and his final match was at Edgbaston in the 1989 Ashes series. 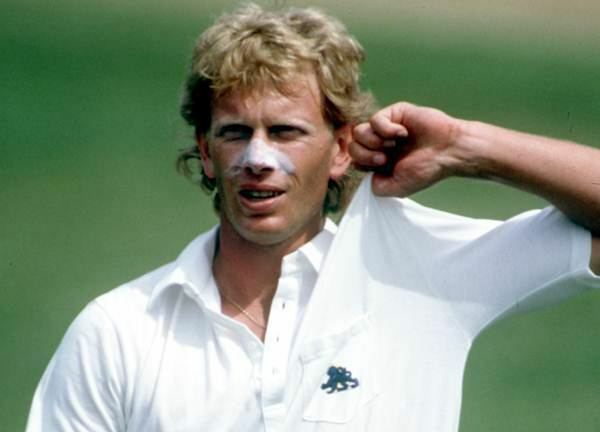 He made certain that he would not be picked again by accompanying Mike Gatting on the rebel tour to South Africa that winter, although he continued to play for his county for a couple more years. Dilley appeared in three of Worcestershire's matches in April 1992, but despite a couple of appearances in the Second XI, he announced his retirement at the end of that season because of recurring injury problems. Dilley's move to Worcestershire denied him the financial security of a benefit season. He found employment after retirement as a coach, firstly to the England women's cricket team, and then accompanying the men's side on the tour to India in 2001/02. He also worked in a coaching capacity for Zimbabwe and Scotland. His last position was as head coach to Loughborough UCCE, where he was director of cricket for 11 years. where he coached, among others, Monty Panesar, James Anyon, Ruel Brathwaite, James Adams and Rob Taylor. Dilley was the father of the Worcester Warriors rugby union captain, Chris Pennell. Dilley died in a hospice in Leicester on 5 October 2011 just one week after being diagnosed with oesophageal cancer, at the age of 52. A memorial service was held in Worcester Cathedral on Wednesday 9 November 2011.